A few days ago, Apple launched their first TV show “Planet of the Apps” to great fanfare. It’s more or less a spin-off of “Shark Tank” with teams of developers pitching their app ideas to an all-star jury with such tech icons as Jessica Alba and Gwyneth Paltrow. The winners receive funding from a VC firm, enabling them to live their dream of developing software. Reactions, at least in my Twitter feed, consistently fell on the spectrum between outrage and disgust. Fiverr’s business model is like Uber for designers — instead of charging adequate and life-sustaining prices for your work, you give it away for literally a fiver. Subsequently, “doers” are preferred. So, why would companies pay for ads like that? Is it just about the there’s-no-such-thing-as-bad-publicity? Are they purposefully triggering Twitter for free exposure? It could also be that we are just not the target audience. A staple of the internet of the naughts were 419 or Nigerian scam mails. Millions of super-rich uncles, presidents and princes had to perish in order to leave behind Quadrillions of Dollars for hopeful recipients. When reading one of these emails (they still trickle in from time to time) one might be wondering who would fall for such an obvious scam. And that is exactly the point. A study by Cormac Herley from Microsoft (and popularized by Levitt and Dubner in Freakonomics) discusses the basic economic problem that scammers are facing: while it’s cheap to send out millions of spam mails, you only have very limited resources for interacting with (and actually scamming) your victims. Every interaction via email or phone costs time, so by adding typos and coming up with ridiculous stories you automatically vet people who would never fall for your scam in the first place. Only the most gullible (and greedy) remain and you can throw your emails at them, hoping for a big payout. Herley explains that this seems like the most economically sound strategy to avoid “false positives” (that is, people who answer a scam email but where all manpower to convince them to hand over their bank account will be wasted). 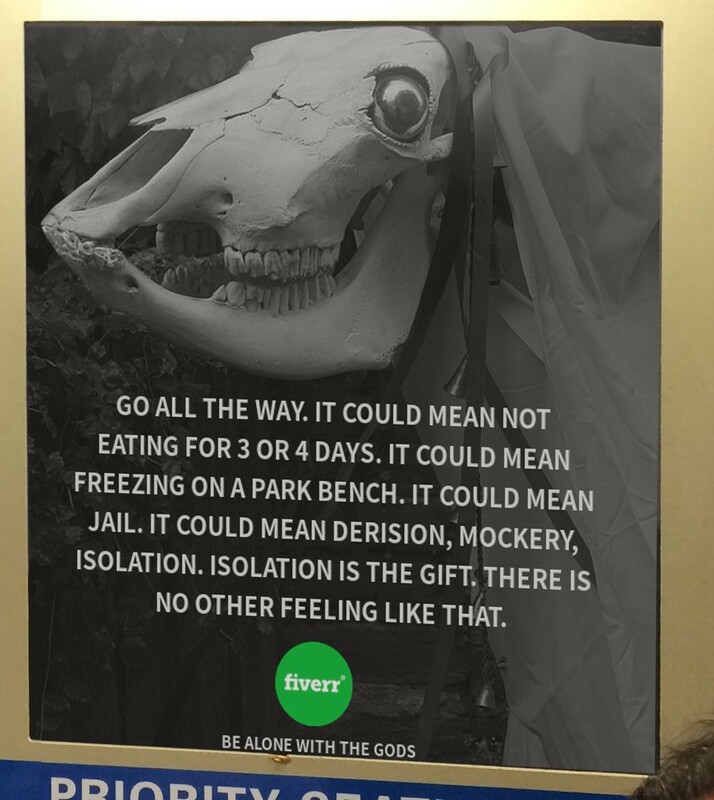 While Apple and Fiverr’s business models are obviously different from that of Nigerian Scammers, their ad strategies for the above examples might work along similar lines. Just like scammers, Planet of the Apps and Fiverr want to keep their rate of false positives as low as possible. They want to make sure that everyone they interact with and spend time and money on will perform as well as possible for their purpose. App developers who in the middle of the show’s season decide that these weird little humans from their emails might be worth spending time with are to be shunned, just like designers who at some point realize that sleeping at least once in three days might be preferable to doing another website for far less than minimum wage. By putting out ads like the ones above you make sure that such people won’t even think about applying for your service. People whose initial reaction is furiously hitting the Quote Tweet button for snark while mumbling something about work-life-balance are not the targets. Not only do you avoid sorting them out later (at much higher cost), but they might even produce free, outrage-driven publicity in the process (this article not excluded). It’s not that you might spend less time with friends as an app developer — you’re no longer able to take care of your children, the people that are probably the most reliant on you. It’s also not that you leave the office a little later from time to time as a designer — you completely forgo the needs of your body, burning out both mentally and physically. And if these prospects don’t thrill you— congratulations, you just saved Apple and Fiverr a false positive. If you like this article, please ❤ or share it! For more like this, follow me on Medium or follow me on Twitter for general ranting.